Woke up early on Sunday morning and headed south on Interstate 5 for our 40 minute drive down to San Diego. En route Lisa suggested I stop off at La Jolla. A very affluent suburb just north of San Diego. What a very pretty town. It is built along the the coastline. The houses are more of what you would probably find along Ridge Road in Umhlanga Rocks!!! and mostly Lamboginis & Porches driving around. Today the sun was out in full force, and everyone was out walking their dogs, softtops were down, and everyone was smilling!! 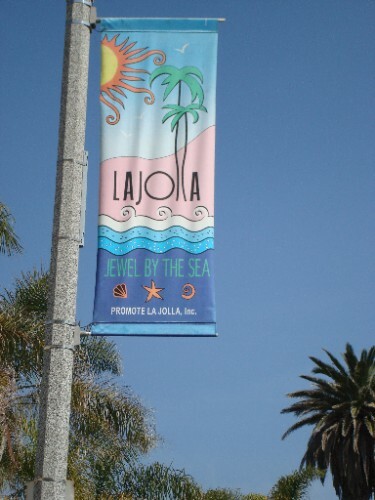 I decided to walk down to the promenade and walk the length of La Jolla. Actually pronounced La Hoya (J is pronounced as H & L is pronounced at Y ~ strange I know!!!) On my walk, I stopped to chat to a lady setting up her T-shirt stall, she said she had just spotted a whale out at see earlier, and what a way to spend her day ~ sitting at her stall watching the ocean and enjoying the sunshine. Next I came along to Seal Cove. Check out the photos in my album. A short beach protected with a rocky outcrop where 100s of seals have quite litterally taken over!!! They like this alcove because it is so protected, and their pups can play while they loll on the beach and enjoy the sunshine. The locals have very good naturedly abandoned the beach for the seals, and it actually draws in quite a crowd. The odd stall selling t-shirts and 'Save-the-seals' paraphanelia make a little profit out of it too!!! I continued along the promenade, soaking up the sunshine, breathing the fresh sea air, and enjoying the view. At the end of the promenade, i made my way back up to the village and sat down for a capuccino. There was a Flea Market on the go, so I wandered around there a bit!! Time to head into town, so I caught bus #30 which took me all the way downtown, I transferred onto bus #7 which took me through Hillcrest, the gay/lesbien district of San Diego, transferred onto a bus #10, and within 10 minutes I was in Balboa Park. Very impressive park with pathways around hugely impressive buildings housing every kind of museum you could imagine!! There was also a Shakespeare Globe theatre there!! I wondered around the maze of museums the whole day, and felt quite cultured by the end of the day!! The only things was that my feet hurt like hell!! I made my way back to Pacific Beach (where Lisa's house is) on the bus, and met up with Lisa, Mike & Jesse ~ we headed to Encinitas, a town along the beach road back towards Carlsbad, and stopped at yet another Mexican restuarant for dinner ~ The Mexican food in San Diego is really, really good though, as you are only a short drive from the Mexican border. When you drive into San Diego along Interstate 5 in the mornings, you see rows of Mexicans standing on the side of the road, hoping to be picked up by someone to do work for them. Cheap illigal labour!!! Amazing, and there are 100s of them!!! After a fantastic dinner & 1 or 4 more margaritas we headed back home, watched a bit of telly, and hit the sack ~ I was knackered after all the walking I'd done, and slept very well!!! Tomorrow was my last day in San Diego, and Jesse had suggested I visit San Diego Sea World - little did I know it was going to be the highlight of my trip!! !